Any person reading the article without detailed prior knowledge of events could only reasonably conclude from it that rather than making a joke about the public-speaking ability of a straight white male Tory MSP, I was accused of a campaign of direct and personal homophobic harassment of a gay woman, a much more serious matter. At the time of writing this paragraph it’s been over two hours since I contacted both the Times and its Scottish editor Magnus Llewellin pointing out this error and asking for an immediate correction. 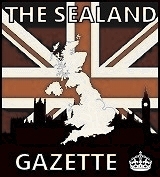 No response has been forthcoming, the unamended article is still in place on the paper’s website, and we are now in discussions with our lawyers. Meanwhile, the Daily Record’s political editor Davie Clegg, who appears (along with Paul Hutcheon of the Herald) to be on a personal crusade on Kezia Dugdale’s behalf in respect of Labour’s funding of the case, announced to the world that Scottish Labour’s MSPs had united behind her. 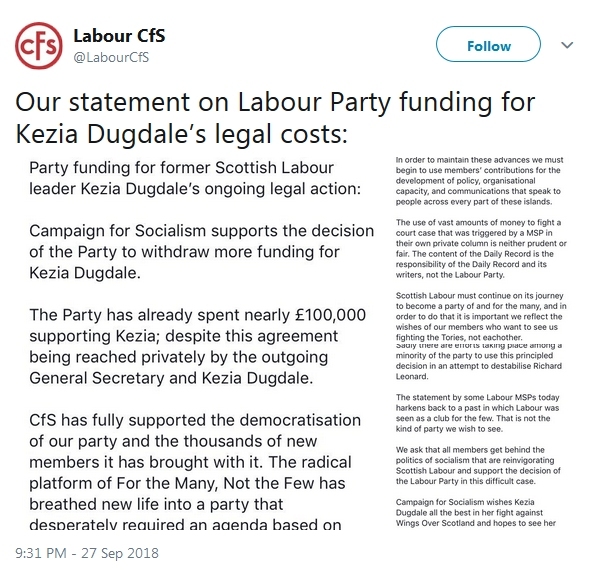 Neil Findlay is a member of the “Campaign for Socialism” group within Scottish Labour, which had in fact issued a statement backing the Labour NEC’s decision to withdraw funding from Dugdale. 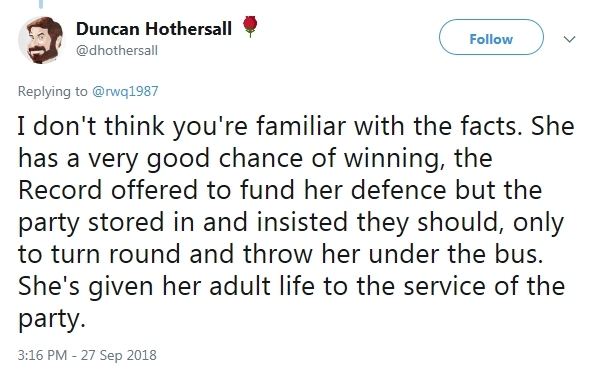 Whenever there’s an outpouring of malicious inaccuracy to be found on social media, Wings readers will of course be asking “where’s Duncan Hothersall?”, and true to form the staunch party activist didn’t disappoint. Despite Hothersall’s apparent sudden acquisition of legal expertise, there is in fact no evidence that the Record made any such offer. 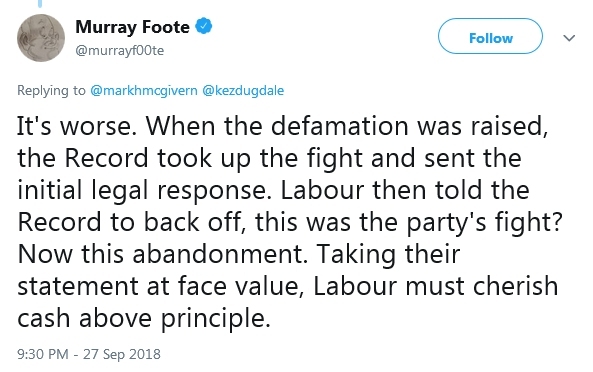 Its editor at the time of the Dugdale column’s publication, Murray Foote, has said only that the paper “took up the fight and sent the initial legal response”, which is a markedly different statement from “we were prepared to write her a blank cheque for whatever eye-wateringly high costs she chose to run up for months and years on end”. Readers might reasonably wonder what was preventing the Record from picking up the reins and footing the bill now, were it the case that the paper was willing to fight to the death for her right to defame members of the public whenever she chose. But instead this week the Record dispensed with Dugdale’s journalistic services entirely, making her none of their problem. 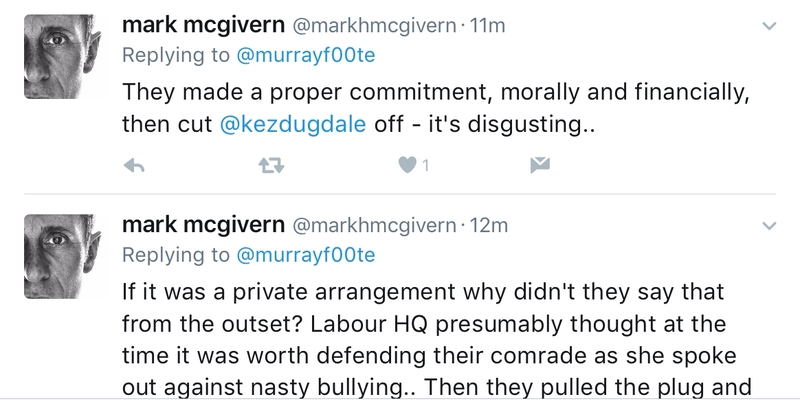 Foote’s ex-colleague, Record hack Mark McGivern, also waded into the discussion with the assertion that Dugdale had been speaking out against “nasty bullying”. When we politely asked him to clarify exactly what he meant by that remark, McGivern hastily deleted the tweet without replying or retracting it. Almost all of today’s Scottish papers carry reports of the Record podcast, a very cosy one-sided affair in which Dugdale, Davie Clegg and Lib Dem MSP Alex Cole-Hamilton all wailed at great sympathetic length about the dreadful injustices supposedly being perpetrated on the former Labour leader entirely as a result of her own actions. 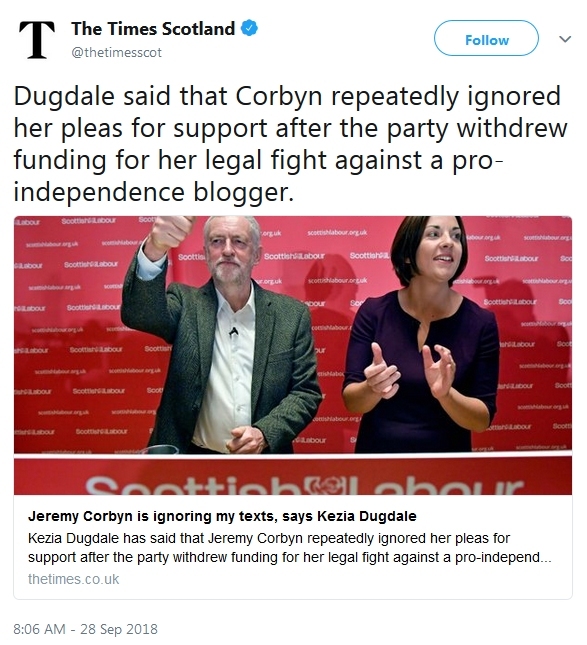 Dugdale herself suggested on the podcast that despite not being able to afford to pay for the costs of the case herself, she intends to stall until around next Easter, when her expensive appeal against losing the first stage is likely to be scheduled. So it seems that we can expect many more months of this absurd and unnecessary circus, and all the attendant lies, misrepresentations and “mistakes” that will bring. We promise to only talk about them here when we really have to. The Times may have updated because it now says near the beginning “Ms Dugdale is being sued in a £25,000 defamation case by Stuart Campbell, founder of the website Wings Over Scotland”. I did not get access to the full article. Not pre-judging anything, but all that was need here was an admission of an honest mistake followed by a retraction and apology. She didn’t do any of that. And thus, here she is. Such is how the mighty fall. 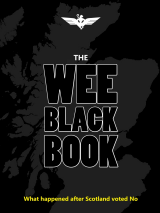 Stu – dinnae hesitate to fire up the Crowdfunder again if you need to. You know Winger’s will be here for you, and no false promises either. 🙂 You’re in the right, stay strong. Commiserations, Rev. You do a phenomenal job for Scotland and bear a huge personal burden because of it. Please look after yourself [and those squirrels, of course…]. Thank you Stu. You may not know this, but you are a good man and some. I read in full the judges deliberations you posted a while back and thought that the world of journalism, smears, wilful pejorative half-truths, weasel words et al are on another planet altogether compared to the meticulous prose and inexorable logic that the law and findings were in that deliberation, written by someone who knows what the English language is and what the law is. Truth, of course, is always a casualty in these Orwellian times. You are a star, and long may you continue shining. Tread carefully. It would be too easy for unionists to spin this by dragging it out, embroiling wings in multiple legal battles and getting us to bankroll it. When really we as a group need to focus our efforts not just on media accuracy but also on convincing Scots the future is better as an independent nation. Don’t let yoons drain our reserves. Financial and otherwise. Good to see the continuing infighting amongst britnat Labour. No sympathy for any of the britnats involved. I cannot get my head around Labour in Scotland. Several examples will highlight my confusion. The debacle around Kezia shows the utter lack of talent available to Labour. How could she have been selected to be the lead person in Scotland? Kezia is simply devoid of the skill set required. How can Neil Findlay become involved in a campaign for socialism? Is this sheer brass neck on his part or does his definition of socialism come from a dictionary that is not available to me? Labour actively participated with the Conservative Party in the indy ref to keep Scotland shackled to a non socialist political system. Labour also tolerates Andy Kerr as a member of it’s NEC. Anyway, Rev, thank you for everything that you do. Witnessed? She drove them into the ground in 2016! Meanwhile: yes to more crowd funding as & when & looking after yerself Rev because we’ll need you more than ever in the next six months. We can all see that this is a drip feed of innuendo and misinformation to blacken your character leading up to the court case. How can anyone expect justice in this country with such an overtly partisan press? I would love all these arseholes to get hauled in front of the Judge and are made to explain themselves. What does any of it matter when what you are judged on in this country is how good a drinking buddy of ‘Kez’ you are? Seriously though when your pals are the Unionist press and every word is tainted and twisted in your favour how could you trust her, politically or personally? Seems Neil Findlay is on to her. When someone lies publically about someone else in a damaging way they deserve to be dragged into court. And they should be held personally responsible. However, the wheels of justice grind very slowly. I’ve lost track of what happened – was there not another defamation case at one point with Rev Stu and a ‘popular’ far right newspaper? Or was that resolved? Yo dawg, I heard you like to be defamed while suing for defamation. Well one thing is clear from McGibberings prompt retraction. They are officially shiteing themselves. I’d say that in itself is a victory worth having. It would seem from the quick deletions that at least some of the Scottish MSPs and journalists etc have learned it is unwise to take you on as you are quick to lawyer up when necessary. Not a bad reputation to have in your situation. Your lawyers must be quite happy having you as a client. One day the media, Kezia & the labour party may stop their stupid games that rightly belong in the school playground however I wouldn’t hold my breath just yet Stuart. They believe their machinations will cause you to take your eye off the ball. Somehow I doubt that will happen despite all the so-called big names that might decide to wade in to put their own bit of spin on this story. Well said: I share your view in its entirety. Beattie Show about to cover this. At 11.30 John Beattie told Stephen Jardine that he would have an interview between Dugdale and Andrew Kerr on his programme. At 12noon when he summarised the contents, there was no mention of the interview. Thanks for the update, Stu. Backup? You got it. The Red Tories in Scotland (formerly known as ‘Labour’) were not known as the Mafia without good reason. The name still fits. It’s difficult to fathom just what Labour are playing at, they are like headless chickens on just about everything. ‘Campaign for Socialism’, that’s where they are at in 2018. Not policy, just an ideology, and that’s as far as it goes and will go. Dugdale has gotten herself into this, she should know the UK Lundon Labour party Britnats look after their own, their ‘comrades’. Looks like she will be well looked after though, but not by her own ‘comrades’. The Britnats have tried very hard to demonise this site, and to suppress information reaching those who prefer the truth backed up by facts. Dugdale has a grudge, she will pay heavily for it, or will some secret donor stump up the cash for her, a ‘comrade’? She told Labour voters to vote Tory to keep the SNP out, so they owe her something. Feel free to keep us all up to date Stuart. The loathesome Barclay Brothers own The Spectator with their BritNat Lacky Brillo in charge and Fraser Nelson of the weird strangulated accent as editor. I would like The BBC and to a lesser extent the other broadcasters to explain just why it is nearly impossible to see a political program without some talking head member of the Spectator’s staff spouting their extreme right wing nonsense. Why is this fascistic little rag and its employees given such prominence – What is the circulatino/readership of The Spectator? In spite of Dunc’s insinuation,Kez surely has No chance of winning.The Revs joke was a ‘spin’ on a joke the previous week on the internet that literally millions of people laughed at.At no time was it ‘homophobic’…..Just ask Wee Ginger Dug. Labour saving their cash for upcoming G.E. maybe . must be running on a limited budget after losing all those members. Adam Price is the new Plaid Cymru Leader, defeating Rhun ap Iorwerth and current Leader, Leanne Wood. Let us be clear. It is Stu who has been defamed. It is HIS choice on how to proceed at every stage. My support has no impact on funds in support of the “Indy Case”. My support is personal on the basis of defending HIM not Independence. The unholy alliance of Scottish Blairite Labour and the Scottish Press is being laid bare. Will they now mount an overt attack on Corbyn just to back up their pal,’Kez’? What exactly is the basis of their devotion to her? Her appearance on IACGMOH raises questions about her Socialist’ principles and her judgement. As we know only too well she is not averse to advocating holding one’s nose and voting Tory when it helps the Union. It leaves Labour in Scotland in an unholy mess if they cannot rely on their traditional allies in the press because of personal grievances. Now she is saying don’t trust Labour because of a personal fall out over her somewhat unreasonable expectations. The interview with Andrew Kerr looks like it is being held back for the main news bulletins. Ms Dugdale seems ‘event prone’ as psychiatrists say and she appears to believe none of it is her responsibility. Dugdale suffers from the same affliction of all British Nationalist Politicians. They think that they are smarter than they actually are. While at the same time knowing that the BritNat Media have their back. If she is forced into bankruptcy over this she loses her job as an MSP. Next up on the British Nationalist Labour List gets her slot in Holyrood. The West End NUJ Blarites at BBC Scotland are going out of their way to drum up support for funding of Dugdales defence today. Can’t have their wee pal destitute can they? Now for some strange reason these self same West End NUJ Blarites at BBC Scotland have NO PROBLEM in actively propagandising for British Nationalist Political Parties in Scotland which drive normal members of the electorate into the gutter. This sentence from the Labour CfS statement seems to sum up the situation entirely. And the Daily Record has stepped in to fund Dugdale. Dani Garavelli and Euan McColm tweet their support. Poor wee Kez. Maybe there’s a lesson here in how she conducts herself and her decision making process. Maybe she should sit down im front of a mirror and ask herself if she is making wise choices. See what conclusion she arrives at. The alternative is that she actually believes her own nonsense and that’s really scarey! The DR have reinstated legal support for Kezia. Labours dream . . . Socialism and fair treatment for the many – not the few. Kezia must be one of the few. Dugdale’s status as a previous local leader who has campaigned against the current national leadership isn’t doing her any favours. That she’s a list MSP is the icing on the cake. If, as has been said, she was made bankrupt she was removed from her position as an MSP that would be a potential calamity should Labour not win a bye-election caused by that. That’s not going to happen though, is it. Assuming Labour haven’t used up all their list candidates all that happens is one of the remainder gets put in her place. Before the Conservative’s pulled a fast one on one of their own candidates you’d have assumed that’d be the next on their list. These days it could be any of them. Basically Labour might have calculated the odds and are banking on Dugdale being given the boot due to this. Rumours, no matter how unlikely, that Dugdale might cross benches to join the SNP might be guiding them. Not being the one offended by her defamation I can only suggest the Rev stings her for legal fees and a sizable donation to charity but limits the impact so Labour don’t get what they want. Any way you slice it Kezia’s days are numbered now and it’s kind of a shame in a way because she was such an easy target, but then again the upside is we still have the rest of them to laugh at and they have only themselves to blame and not…..
I’m thinking of publicly denigrating the integrity and beliefs of someone I’ve never met. Maybe a British nationalist political party and newspaper might pay my legal costs. This is where a party should require permission from any elected representative engaged in activities outwith their particular parliament before that might result in a court case that results in their being barred from office. Remember the stooshie over Dugdale’s apparent lack of permission for I’m a Celeb. Far more chance their mouths will get them in trouble if given a platform on news or other media. 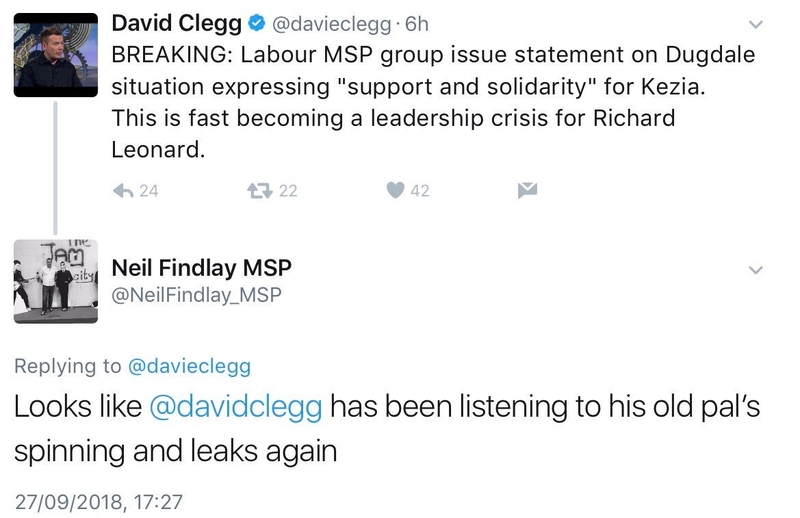 If Dugdale’s stint on the Record was in any way official then Labour are, perhaps, breaking that link and burying evidence. And to think she could have avoided all this by apologising! Too arrogant to even do that! We are all with you Stuart and if you need to run another crowdfunder I’m in. Kez’s faither must be mortified at this fiasco. Fred’s two minute Scrambled eggs, beat up three eggs, add to sizzling melted butter in a pan & move aboot. When nearly ready add some cream & season! Viola. No doot payed out of their “Local Democracy Reporter” wedge from the British Nationalist State Broadcaster. Dugdale now writing a column for Johnston Press title I believe. This reeks of tax payers money laundered by Westminster being used to prop up a failed British Nationalist politician. Just business as usual in this corrupt Neo Fascist British Nationalist State. This is one to make Soft NOs sit up and take notice of the forthcoming Brexit Omnishambles. This on again off again funding thing is going into shark jumping territory at this point. Thank goodness we are not the labour party and we will stand behind you come what may. If another crowdfunder is needed just say the word. Too arrogant to apologise and too stupid to realise she was wrong. 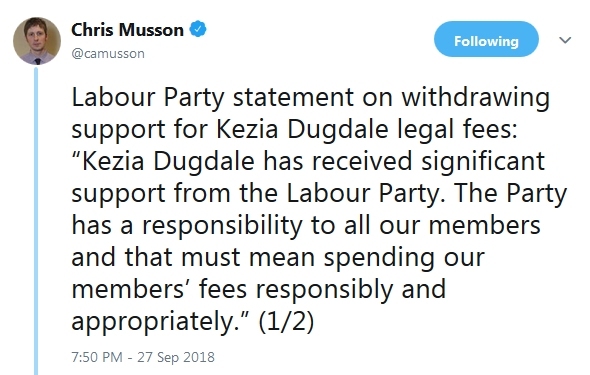 Frankly, I don’t know which is worst, Kez’s stubborn insistence in taking this absurd thing to the limit (as is her right), or the Corbynites back stabbing of her as soon as they got the chance. Actually, I think I do. Not much fraternité in NorthBritLab. (Except with the Tories, it would seem.) But then, what’s new? This is why we have long wanted rid of this sackful of useless ferrets. And if you think Kez did a bad job of leading =ahem= the Ferret Club, just wait. After the Corby gloss wears off, as it is rapidly doing under the pressure of events, watch how Dicky Who? takes them to a new low. They are their own worst enemy. OH Kezia Dugdale oh oh oh, one of the privileged few will soon know what its like for the unprivileged many . 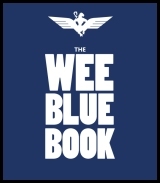 I’ve saved ah bob here an ah bob there ( naw am no dain ah bob ah job ) but the monies there fur the asking Stu , show these Barstewards that it will cost them dearly for their attacks on Wings . Stall around? FGS! Is her legal team going to go along with that? I reckon someone, other than the non-legal gasbags Clegg, Hutcheon, Hothersall, McGivern and Alex Cole-Hamiltons of the world, will be putting her straight on this. Well if the Daily Record back her we’ll be looking for transparency in relation to where the money is coming from. I doubt the vast majority of TV licence-payers in Scotland (it’s ok Robert I know the money goes to the Treasury first, lol) will be non too happy with that. And forgot to mention in my last post Stu. Take the case all the way, plus any others that get caught up in this net, as we’re right behind you. Good grief I was not aware that the BBC was bankrolling newspaper journos. Looks like a complete conflict of interest and also that newspapers dont have to adhere to the BBC charter itself. So significant Public money is issued via BBC to pay private interest newspapers who have their own partisan political agenda to push. The UK really is a cesspit. The papers concerned should have to put something on their mastheads eg.’Britains bested paper sponsored by BBC’. With the ( soon to be ) passing of ( bankrupt ) Kezia Dugdale the ‘Scottish’ Labour Party will have a major problem in finding her replacement . When you have the likes of Kezia , joanne Lamont , James Kelly (LOL )as MSPs , it is clear that you have already scraped the barrel looking for someone with the intelligence of an amoeba , so what is left ? I can’t blame Labour for being unhappy at this strategy. She was being paid to do something non-political, non-Labour. She made a mistake and now wants party members to pay hundreds of thousands to make sure she can’t be held to account for it. She is overused to privilege, parliamentary and otherwise, which she has, and is still, trying to abuse. Why are there so many arseholes in the media, more so at the DR. However it works both ways so I now have TWO reasons to donate when the Rev calls. In my opinion, Dugdale is being very badly advised. As others have pointed out, all she had to do was issue an apology, and the whole matter would have ended. Her life would have gone back to normal, and, to be honest, within a few days or weeks, everybody would have forgotten all about it. Now we have this nonsense of a politician careering around TV studios, to try to find somebody who will understand her financial predicament. Some might liken it to begging. In the process she is burning her bridges with the political party she has served for many years. It is ridiculous. Will nobody close to her tell her this. will none of her friends point out that once you fully grasp what the original comment by REVSTU said, it is blindingly clear it wasn’t homophobic. Dugdale’s reaction has been absurd to say the very least, in my opinion. Ha ha ha. Spot on JWT. I wrote that but know full well that there are a million and one ways that these people can cover up and will do. I see it that way too Gary. Your post is getting lost on this thread today, Welsh Sion, surprise, surprise. I’m sorry to hear that Leanne Wood lost the leadership contest and I must say that I don’t know anything about Adam Price at all. Will he be a good leader? I wonder what would happen to hothersall’s fragile mind if Dugdale jumped ship to join the SNP? I appreciate that Dugdale v Campbell is a bigger story in Scotland at the moment than the developments in my home country, esp. in the sister Party of the SNP. I don’t think they like you Stu. You won’t lie down and let them walk over you. Of course they will be planning and plotting to crucify you. But they would be doing that if you were even 10 percent as effective as you are. Planning and plotting is what they do. They have no moral fibre. Anyway, like everyone else here, I am in the wings waiting to support you in whatever way I can for as long as necessary. My heart goes out to you. And now, the end is here. And so Labour faces the final curtain. And more, much more than this, they did it their way. Regrets? No – they have none, that’s very true. They were in it all, stood for themselves and did it their way. They’ve troughed, they’ve laughed and lied. We’ve had our fill, our share of losing. To see Labour falling apart. The record shows we took the blows and will do it our way! Yes, it will be our way! Could she end the case now by withdrawing her original statement? Is it a Price worth paying, for the Rich? Clegg’s awe ower, Scoattish poalitics. Quick!, cuff thum aff. K. Dugdale, thocht thoan Record bit wiz smert. Bit tae add taeit, live ett Hoalyrood wiz fuullherdae. 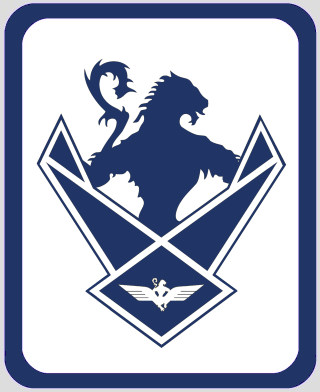 Wiz urr jaunt, tae yoan antipodes, no meant tae peiy furrit?